(Photo: REUTERS / Fayaz Aziz)Christian women mourn next to the coffins of their relatives, who were killed in a suicide attack on a church, in Peshawar September 22, 2013. A pair of suicide bombers blew themselves up outside the 130-year-old church in Pakistan after Sunday Mass, killing at least 56 people in the deadliest attack on Christians in the predominantly Muslim South Asian country. Pope Francis has called for the world to stop hiding persecution of Christians while condemning two attacks by suicide bombers on two churches in Pakistan that killed at least 14 people. The Pope made his plea to crowds gathered at St. Peter's Sqaure on March 15 following the bombings at two churches in the eastern Pakistani city of Lahore. The two bombings killed 15 people more than 70 were wounded after the bombings of a Catholic church and an Anglican church during Sunday services. "With pain, with much pain, learned of the terrorist attacks today against two churches in the city Lahore in Pakistan, which have resulted in numerous deaths and injuries," said Pope Francis. The twin attacks took place on churches only a few hundred metres (yards) apart. One of the churches was the Catholic church of St. John, the other was the Anglican Christ Church. The Pope said, "These are Christian churches: Christians are being persecuted. Our brothers shed blood only because they are Christians. Francis prayed, "That this persecution against Christians, which the world tries to hide, might end, and that there be peace." Protestors rampaged through the streets of Lahore after the suicide bombers attacked two churches during morning services, The Washington Post reported. The Taliban in Pakistan said it carried out attacks, reviving concerns that the Islamist militant group will increasingly target religious minorities in a bid to further divide Pakistanis and distract them from ongoing military operations against extremists. The consecutive blasts shook the Youhanabad neighborhood inhabited mainly by Christians during Sunday prayer services, police officials said. Police said two suicide bombers detonated explosive vests next to Christ Church and St. John's Church after security prevented them from entering the compounds, which are a few hundred meters apart. 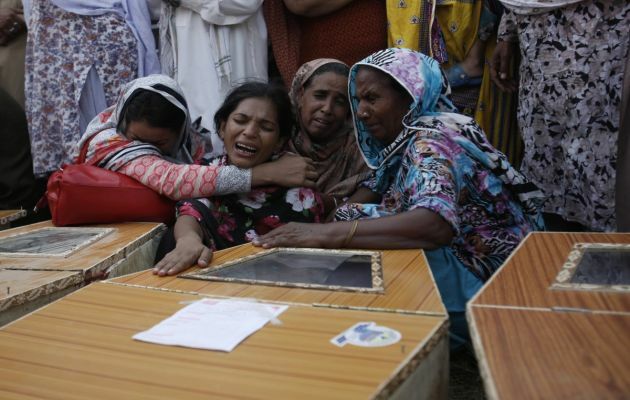 Sadaf Saddique, who heads the Good Shepherd Ministry in Pakistan, told Vatican Radio, "These attacks have led people into the thought that they are unsafe anywhere." Saddique, a lawyer, said, "We never thought that Youhanabad could be attacked, we never thought that people would dare to come into this place, and would attack such a big Christian town." Christians make up about 2 per cent of Pakistan's more than 182 million people, and have faced increasing violence directed at them in recent years.